"This is the territory of Wyoming. The year 1866. On this soft, sunlit day of early summer, men of two different worlds have come together to talk. There is bitterness here, suspicion and distrust. You remember your friends and loved ones who have been killed. You've seen the bones of the settlers on the trail and the bleached ribs of their wagons. And still they come pushing west with a vision, a vision of farm and town on land they can call their own. They come by the hundreds to reclaim the wilderness under your protection, the army of the United States. And in your hearts and minds there is also bitterness and hatred because you also have a vision of sacred hunting grounds silent and empty, of buffalo, elk and beaver, your food, clothing and shelter vanished forever, of starvation and sickness, where once there was plenty. This is the Laramie Conference, a powder keg that may explode at any moment. It would take little to light the fuse. There are important and powerful men here. On one side the leaders of the Sioux nations. On the other, representatives of the United States. But on this day it will take a great man to see both side. Jim Bridger, pioneer, trapper and scout is such a man." Also known as Battle of Powder River. the movie is set in 1866 Wyoming and is based on a true story. Gold has been discovered again on Sioux land and Frontier scout Jim Bridger (Van Heflin), who was married to a Cheyenne, tries to look out for the Sioux's rights. Bridger talks about the four treaties the US had with the Sioux, each of which has pushed the Sioux further from their lands. Red Cloud (Johnny War Eagle) talks about how the soldiers are building a fort so they can again steal their land. The Sioux says that the white man's promises are written in water and that the peace conference is fake. Bridger was going to leave the army but when his friend Monahseetah sees a Lt. Dancy, he mysteriously signs back on as a scout. When two Indan boys were looking at their horses, Lt. Dancy shoots one of the boys down in cold blood. Dancy tells Julie, a woman whose wagon he is escorting, that he got a taste for Indian fighting when he was out of the army. He fought with Chivington's volunteers (they were responsible for the Sand Creek Massacre of Cheyennes in 1864). He says "Chington was quite a man. We had a high time." The Indians, in retaliation for the killing of the boy, attack the wagon and shoot the medicine show man. Lt. Dancy and a sergeant chase the small band of Sioux but don't catch them. Later Bridger gets the sergeant alone and gets the story of how Dancy killed the boy. The Sioux later ambush a cavalry detail. Captain Fetterman wants to attack at once, having no regard for the greater numbers of Indians and Lt. Dancy agrees. Monahseetah tells Bridger that Julie went out and has not come back. Bridger goes looking for her and saves her from an attacking Sioux brave, Lone Elk, who ignored his warning to stop. Bridger is forced to kill him in a knife fight.Bridger tells the racist Julie that it was Monahseetah who told him. He also tells her that Monahseetah is not his wife. He tells Julie that his wife was killed in the Sand Creek Massacre. He tells how the Colorado Volunteers under the leadership of a preacher named Chivington rode out to Black Kettle's village and killed 200 men, women and children. Monahseetah was Black Kettle's daughter and she saw her mother and father shot and her sister Mantow cut down by a saber with a baby in her arms. Mantow was Bridger's wife and the baby was his son. Bridger gets Julie back to the fort, but the Sioux will also be coming. Lone Elk was Red Cloud's favorite son. Dancy tells Julie that the Sioux are asking for it. Julie tells Bridger that Dancy had told her that he served for two years in Chivington's volunteers. It confirms what Monahseetah told him, about Dancy being his wife's killer. We then see Captain Fetterman, goaded by Dancy, chase a small group of Sioux. The small group quickly turned in to 2000 and we have the historical Fetterman's Massacre. Eighty men had been killed. In the movie Dancy escapes the Massacre (in real life the whole command was wiped out). Bridger goes after Dancy and when he catches him, Dancy says that Chivington told him he had to kill that squaw (Mantow). A young Indian kills Dancy before Bridger gets a chance to. Red Cloud has his men attack again but now the army had the new breech loading guns, which fire three times as fast as the old ones. The charging Indians had no chance. 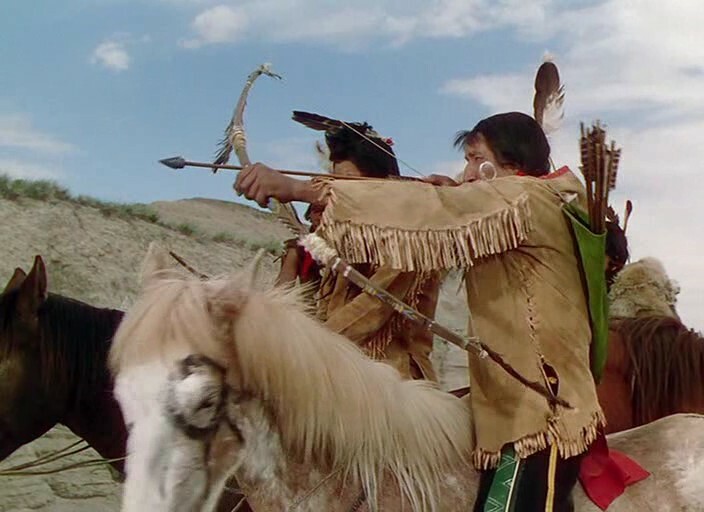 The movie ends with the Sioux getting a new treaty in a pretty corny ending. The Sioux and Jim Bridger speak Sioux, and Jim Bridger also speaks Cheyenne to Monahseetah. The Indians in the movie were played by Native Americans. The movie was beautifully filmed in Technicolor and there are some good village scenes. The movie also had some good history with real historical figures Jim Bridger, Colonel Carrington and Captain Fetterman. It also had a very graphic, and very true description of the Sand Creek Massacre. We also see how the Fetterman massacre, which was very famous at the time, took place. A very good, and very underrated movie.